Many people believe that famed cybernetics company iRobot only makes droid vacuum cleaners - for instance the nifty yet slatternly "Roomba" autodrudge. But iRobot also makes more sinister machines, for instance the new "Warrior X700", which it has just sold to the US Army's tanks'n'trucks R&D arm. Weighing about 450 pounds all up - about the same as a middling quad bike - iRobot describe their latest battle-bot as "a powerful and rugged" machine. “We are confident that the iRobot Warrior will secure a strong foothold,” said Joe Dyer, iRobot gov'n'biz bot-boss. The company says that it sold two prototype Warriors to the US Army Tank-Automotive Research, Development and Engineering Center (TARDEC) for $3.75m last week. The machine warriors can carry almost any payload up to 150lb or so, on a unique sliding fore-and-aft platform which lets them maintain their balance going over obstacles, up stairs etc. An iRobot Warrior can be fitted with various kinds of grappler arms, bomb-disposal gear, hazardous-materials kit and so on. 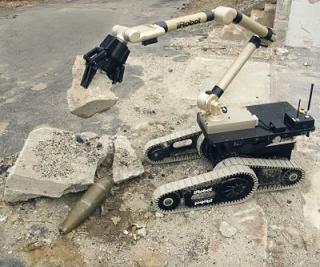 But iRobot also specifies that the machine is good for "building clearance", "SWAT" or other "Weaponised Missions". Company literature (pdf) shows the droid fitted with a "Metal Storm" quad-barrel superimposed grenade launcher, able to spurt out sixteen 40mm frag warheads in a fraction of a second. And that's not the only trick the heavily-armed vacuum cleaner firm has up its sleeve. It has also been reported that the company is exhibiting its smaller PackBot wardroid - almost two thousand of which are already in US service - with a crafty new feature. Now that's fiendishly cunning, and definitely helping to mitigate the "drinking-straw" limited view problems of remote cameras. It could also go well with vehicle-mounted or standalone robo-cannon systems like the PAWS, also just reaching the market.